NEW YORK (CNS) — Teenagers are still on the run — when they’re not too busy killing one other — in “The Divergent Series: Insurgent” (Summit), the follow-up to last year’s kick-off of the futuristic franchise. 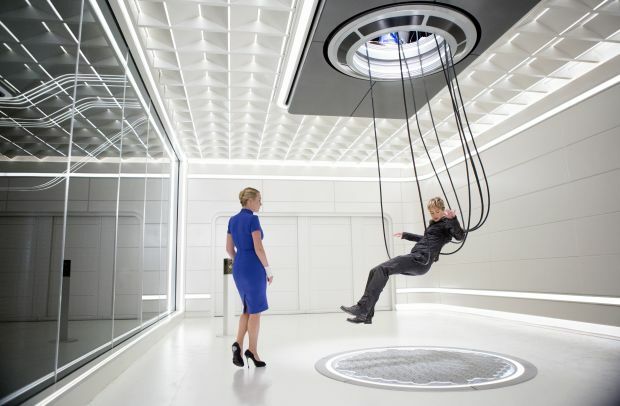 Based on the second book of the trilogy by Veronica Roth and directed by Robert Schwentke (“The Time Traveler’s Wife”), “Insurgent” is faster-paced and sleeker-looking than its predecessor, with echoes of “The Matrix” in its stylish 3-D slow-motion action sequences. But it also ramps up the violence and moral ambiguity, placing this film squarely outside the proper reach of younger adolescents. For the uninitiated, the setting is post-apocalyptic Chicago, a walled city run with an iron glove by Jeanine Matthews (Kate Winslet). She oversees a regimented system whereby people are divided into factions, each representing a different virtue: Candor (honesty), Amity (peace), Erudite (knowledge), Dauntless (bravery), and Abnegation (selfless). Those who are not easily classified are called Divergents. Their independent nature is a threat to the status quo, and Jeanine commands that they be hunted down and killed. Enter our heroes, Tris (Shailene Woodley) and her mentor-lover Four (Theo James). When we last saw this duo, they had recruited an army from members of their Dauntless faction and foiled Jeanine’s dastardly plan — though at the cost of Tris’ parents’ lives. Now they’re renegades on the run. An elaborate cat-and-mouse game ensues, as both sides try to gain the upper hand. Tris would make the same claim. Circumstances have transformed our initially meek teen into a battle-hardened Joan of Arc. Internally, though, she’s conflicted, torn by a desire for revenge yet wracked by guilt, blaming herself for the deaths of so many, and unable to seek forgiveness for her sins. To Tris’ credit, she stakes out the moral high ground when possible. She’s also concerned about others, including her brother, Caleb (Ansel Elgort), and fellow Dauntless member Peter (Miles Teller). Their allegiance to the cause is questionable, and neither is to be trusted. Amid the mayhem, new characters are introduced. Johanna (Octavia Spencer), saintly head of the Amity faction, offers sanctuary to the rebels on her farm outside the city. Though presumed dead for years, Four’s mother, Evelyn (Naomi Watts), turns up as the creepy leader of an underground army. She has a score to settle with her old friend Jeanine, and seeks sonny boy’s help. As “Insurgent” lumbers toward its explosive climax, the death count rises. And chivalry clearly has no place in this version of the future, where men hesitate neither to beat women to a pulp nor, when the occasion seems to demand it, to slaughter them. The film contains intense violence, including scenes of torture, nongraphic nonmarital sexual activity and some crude language. The Catholic News Service classification is A-III — adults. The Motion Picture Association of America rating is PG-13 — parents strongly cautioned. Some material may be inappropriate for children under 13.